Advanced sensory technology is connecting smallholders in Nigeria with information about their soil health, helping to take the guesswork out of farming. Farmers in Nigeria are accessing soil data in real-time to better manage their crop growth and access financing that was previously out of reach. Zenvus, a precision farming company, has created electronic sensors with in-built GPS, which are placed in the soil to measure pH, nutrient content, moisture level and temperature. The data collected from different farms is aggregated and analysed according to location, and the appropriate advice is then provided to farmers via a ‘SmartFarm’ web and mobile app. Using this data, farmers are able, for instance, to apply the correct fertiliser and optimally irrigate their farms, leading to enhanced farm operations, reduced input waste, and improved productivity. Farmers can also collect on-farm images of their crops using the Zenvus ‘Yield’ – a hyper-spectral imaging camera that monitors farm vegetation to detect potential problems, including crop disease, pests, and drought. Smallholders take photos of their crops and send them through the SmartFarm app to receive advice. “Our business is designed to remove guesswork as a farming strategy by enabling data-driven farming systems and processes across a nexus of modern agriculture, including credit, irrigation, planting and harvesting,” says Professor Ndubuisi Ekekwe, founder of Zenvus. Financial service providers can also access the farm data collected – if previously agreed with the farmers – to help with decisions regarding the provision of insurance, loans and/or investment. Using the GPS software within the sensors, the technology also gathers data regarding farm boundaries and land area. Investors can review this data – along with information on the type of crop grown – to work out potential yields and profits when considering investment. Zenvus independently analyses and verifies the data collected, and lenders pay a subscription fee to view the information through a separate platform called ‘ZCapital’. Another Zenvus service, ‘ZInsure’, enables farmers to apply for insurance by uploading data about their farm, which is also independently verified by the company. Not only do insurers benefit from access to standardised, verifiable information, but farmers are also able to access customised insurance, which helps reduce premiums. “Zenvus has used technology to remove information asymmetry, making it possible for farmers to share data with lenders and insurers, creating a specialist system, which has improved their capacities to access credit. Enabling lenders to know what they are funding gives them higher confidence to provide credit,” explains Ekekwe. The SmartFarm technology, which costs €175 to €525 depending on the size and scope of the sensors, as well as the data transmission source (cellular, WiFi or satellite), also provides services for different subscribers. Fertiliser manufacturers, for instance, can use the data collected to determine what fertilisers to produce to meet the soil nutrient requirements of farmers in specific regions. The data can also be used by government or development organisations looking to keep track of farms they have supported in a particular location. Following its launch in 2014, SmartFarm was first deployed in the eastern part of Nigeria. The technology has since been scaled out to 500,000 farming entities and is used nationwide in Nigeria, as well as in Botswana, Ghana and Rwanda. “I was initially sceptical [of the Zenvus sensor], but later decided to try it. I got a huge crop yield and harvested so much. 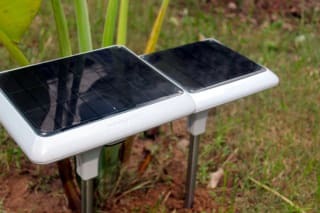 The good thing is that the device is so easy to use,” says Cyracus Obiah, a farmer from Imo state in Nigeria. To increase agricultural investment in Nigeria, an agri-tech start-up company is pooling funds from numerous city-based investors and providing support to farmers via a digital platform.